Justin Rose reached a career high ranking with Open winner Francesco Molinari moving up to sixth when the latest world rankings were announced. Molinari’s recent form has seen him climb from 33rd after missing the cut at The Players to his peak of sixth following his breakthrough win at Carnoustie. Since that forgettable week at Sawgrass, the quiet Italian has added wins on both sides of the pond with victory at the BMW PGA Championship, the European Tour’s flagship event, after holding off Rory McIlroy followed by a win at the Quicken Loans National where he stamped his authority on the field by finishing with a Sunday 62. 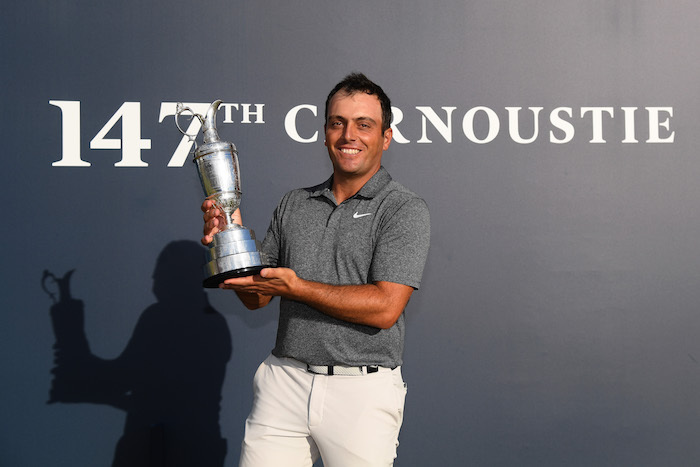 Those wins – and his Major triumph – were bolstered by second place finishes at the Italian Open and the John Deere Classic lending ample support to the claim that Molinari is the planet’s hottest player and richly deserving of his new status in the game. Justin Rose, second at The Open after making the cut on the number – is now second in the rankings behind Dustin Johnson. The Englishman’s numbers since missing the PGA Championship cut last year are staggering. In 23 starts across both tours, he has four wins, finished second twice, 3 top 5s, 8 top 10s and has not missed the cut. That sublime run has now taken Rose past Justin Thomas after moving ahead of Brooks Koepka, Jon Rahm and Jordan Spieth in previous weeks. Spieth, who co-lead with 18 to play at The Open before a 76 on Sunday, has dropped to eighth behind Molinari and Rory McIlroy with Rickie Fowler ninth (down from 7th) and Jason Day rounding out the top 10. Tiger Woods, who at one point held the outright lead on Sunday, is now 50th after rising 21 places from last week. While his comeback waits for its exclamation point – a win – his rankings have lifted him into the WGC Bridgestone after starting the year ranked 656th. There wasn’t much good news for South Africans beyond Brandon Stone and Erik van Rooyen. Stone, who won two weeks ago at the Scottish Open, moved up three spots and now SA’s fifth highest ranked player after edging Dean Burmester this week. Erik van Rooyen moved up 21 places after finishing T17 at Carnoustie and is now SA’s eighth highest ranked golfer.